The Pre-Raphaelite show at the Tate reveals nothing new or interesting about these one-time artistic and political radicals – other than their demotion to the realms of English middle-class good taste. When I was a university student, my friends Monique and Angela and I were obsessed with the art of the Pre-Raphaelite Brotherhood – richly coloured portraits of glazed-eyed women with pale skin and luxurious auburn hair, draped langorously in green and scarlet silks and velvets against a backdrop of carefully art-directed moral decadence. I remember Angela proudly displaying her newly-purchased Pre-Raphaelite calendar for the admiration of Jacko, our hall of residence’s favourite and frequently shirtless muscle jock, while we in turn admired his over-pumped pecs and obscenely short shorts. Jacko, as I recall, said that he didn’t really “get” art, but that it was important to “be into whatever you’re into”. Aristotle couldn’t have put it more beautifully. The art of the Pre-Raphaelites – Ophelia drifting serenely down the flower-strewn river, Lady Lilith combing her hair as she stares at herself balefully in her hand mirror, Mariana arching her back in sexual frustration in her moaten grange, the Lady of Shallot letting out her swan song in her own funeral barge – matched perfectly with our undergraduate English syllabus, in which our ancient professors had us dutifully read a lot of Shakespeare, Tennyson and Browning and disregard anything written after 1910. It also matched the kind of sensibility we were imagining for ourselves, as romantics, intellectuals, artists, radicals and possibly even lovers. The Pre-Raphaelites encapsulated everything that we wanted to move towards and which was conspicuously lacking in the t-shirted and jandalled landscape of 1990s New Zealand: luxury, artificiality, eccentricity, decadence and a lot of crushed velvet. Raised in a country where sunburnt rugby boys like Jacko were exhalted as gods, the Pre-Raphaelites spoke to the weird, pale-skinned unsporty kids like me who favoured asymmetrical haircuts, blue velvet jackets and affected knowledge of romance and grand passion and tragedy possibly before we’d actually experienced them first-hand. My blue velvet jacket is long gone (given away years ago to a charity shop, where I hope it found a younger, thinner, hipster-wannabe owner) and while I very rarely lie around the house on a chaise longue brushing my hair and waiting for the return of my lover, I still have a soft spot for the Pre-Raphaelites, and visit the permanent collection at the Tate Britain to say hello to them occasionally. I’m now old enough to be amused at seeing a couple of turns of the wheel of life, as they rise to fashionability again. The autumnal colours, crushed velvet capes and consumptive fallen women of Millais and Rossetti and Holman Hunt and Woodhouse’s paintings have been integrated and reinterpreted in the recent flood of films and TV shows inspired by Arthurian myths and Tolkienalia (Lord of the Rings, Game of Thrones, etc) and especially by Florence Welch, lead singer of Florence + the Machine, a pale-skinned red-headed beauty with a penchant for billowy bell-sleeved chiffon dresses, who looks as if she’s stepped out of a Rossetti painting. Which leads me back to the Tate’s retrospective show of Pre-Raphaelite art, now in its final week, and impressively sub-titled “Victorian Avante-Garde”. Wandering slowly through the hordes of tweedy old ladies, all clutching their John Lewis and Waitrose shopping bags defensively, and listening to the well-bred coughing of disdain as someone broke a rule of art gallery etiquette (queue jumping, answering a mobile phone loudly, pushing ahead to see a painting without saying “excuse me” first), I sighed as a little part of my former Pre-Raphaelite-loving student self died inside. Things got worse in the gift shop, where I watched the feverish rush of the masses to buy Pre-Raphaelite postcards, coasters, mugs, calendars, placemats, posters, coffee table books, scarves and jewellery. It was then, as I punched an old lady in the face to buy the last Ophelia-themed postcard before she did, that I realised that the game was up. Whatever claim to radicalism or avante-garde politics the Pre-Raphaelites once had has long since disappeared, as their aesthetic has been absorbed into the behemoth of middle-class good taste. What was once scandalous is now the design for a cushion cover. What was once sexually provocative and challenging to moral codes is now considered piquant, charming, or “nice” – the sentence of death for all art. It’s inevitable, I suppose, that through the march of time and the change in moral codes, what seemed racy in the 19th century will lose its capacity to shock in our more sexually explicit and cynical age. Still, the legacy of the Pre-Raphaelites could have been helped with a more imaginative and provocative curation than the anaemic display the Tate have come up with for this show. As a collection of paintings, it is a remarkable display, with works drawn from the Tate’s own collection, European and American galleries, and private owners, notably the creepy Andrew Lloyd-Webber, who has a prominent collection of Pre-Raphaelite paintings (and whose own obsession with the movement mutated into the 1980s horrors of The Phantom of the Opera). There are also some fine examples of Morris & Co‘s original wall tapestries, carpets and Morris’ intricately decorated and printed editions of Chaucer. But despite the “avante-garde” sub-title and narrative commentary encouraging us to think of the works as radical, there’s very little that’s remarkable about the exhibition. A more interesting display might have tried to view the period in its social and political context, or by comparing the Brotherhood’s works to their predecessors and contemporaries (as the Tate did in its marvellous Picasso show last year, where Picasso’s works were shown alongside British artists who’d been inspired by him, including Francis Bacon and Henry Moore). It’s a period that also seems ripe for a thorough feminist analysis. 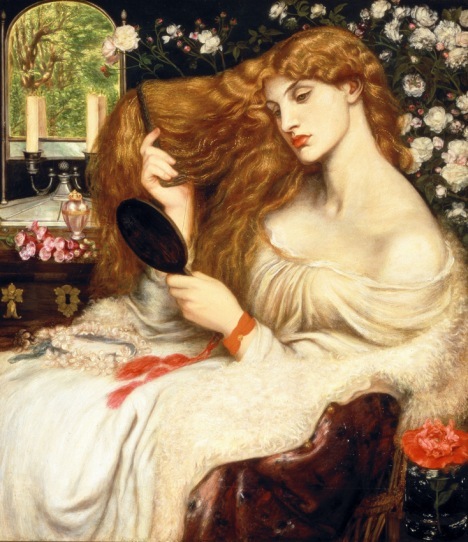 While many women (Monique and Angela included) loved Rossetti’s sensuous display of all those pale rose-lipped lovelies, the case could be made just as easily for the Pre-Raphaelites as a bunch of sleazy pornographers who painted women as dead-eyed zombies, eroticising their vulnerability and complicating things further by shagging their working class models and taking them as mistresses. Looking at the paintings again, I was surprised by how weirdly inert many of the women look, how forced and uncomfortable their poses are, how creepily paedophilic some of the portraits of young girls are, and how morbid the painters’ preoccupation with their female models’ vulnerability and sickliness is. Couldn’t the Tate have set Germaine Greer and Camille Paglia up in a mud-wrestling ring and let them knock each other out while discussing Pre-Raphaelite art for an hour or two? There’s a much more satisfying display of the radical politics and industry of the Pre-Raphaelite Brotherhood in the re-opened William Morris Gallery in Morris’ childhood home in Walthamstow. The gallery, which has free admission (unlike the Tate, which charges £12 for entry to the Pre-Raphaelite show) houses a fantastic permanent exhibition of Morris’ writings, art, textiles and furniture, with a re-creation of his workshops where Morris & Co wallpaper and fabrics were printed and woven by hand by his team of artisans. The curation smartly reveals the conflicting nature of Morris’ socialist beliefs with his industry as a maker of home furnishings that could only be purchased by the well-off. I suspect that Morris would’ve approved of the gallery not charging for admission, though it’s difficult to imagine what he would have thought of the kitschifying of his work and designs into gift shop merchandise. Somewhat chastened by the exhibition, it now feels like another nail has been driven in the coffin of my adolescent love of the Pre-Raphaelites. Time to put these bad boys and their pouting subjects to one side for a while, shake the cobwebs out, drain the moat, kill the dragon, let some light into the panelled bower, burn the crushed velvet canopy and go and get some fresh air. RIP.